BOGOTA (Reuters) - Thousands of Venezuelans broke through barricades along the international border with Colombia on Tuesday, according to the migration office in Bogota, which warned Venezuelan President Nicolas Maduro that he would be held responsible for any problems that may occur. Maduro in February blocked bridges joining the two nations in a bid to prevent a U.S.-backed effort to distribute hundreds of tons of humanitarian aid to the crisis-wracked nation. 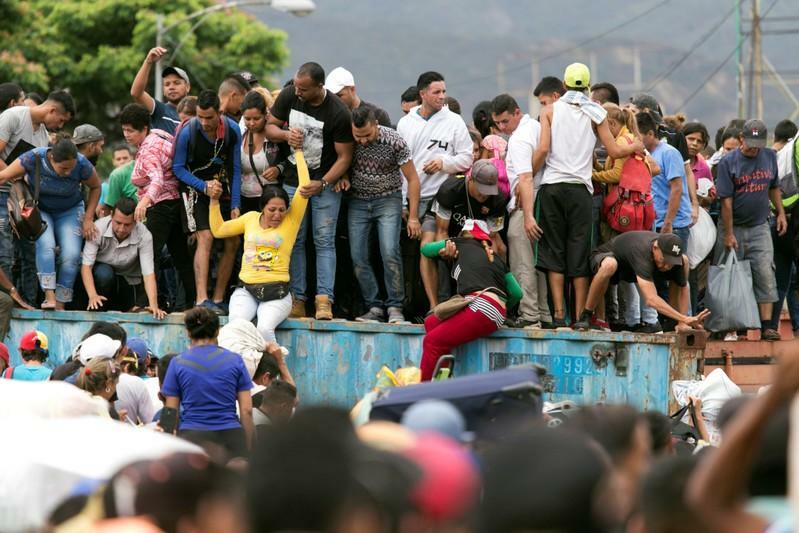 With bridges blocked by containers and trucks, Venezuelans have been wading through the Tachira River to reach the city of Cucuta, on Colombia's northern border, to find food, medicines and work. But torrential rains in recent days has made that impossible. "The usurper Maduro is responsible for anything that may happen to the population that is transiting between the two countries," said Christian Kruger, head of Colombia's migration agency, highlighting the risk to the Simon Bolivar bridge being weakened. Millions of Venezuelans have fled to Colombia to escape widespread shortages of food and medicine in their homeland, seeking jobs locally and passage into other Latin American countries. Venezuela plunged into a deep political crisis in January, when Juan Guaido, head of the opposition-controlled congress, invoked the constitution to assume an interim presidency, arguing Nicolas Maduro's 2018 re-election was not legitimate. U.S. President Donald Trump has taken steps to ratchet up pressure on Maduro and bolster Guaido, who has been recognised as president by the United States and more than 50 other countries, including Colombia. Colombia's government says providing Venezuelan migrants access to basic services and expanding healthcare, education and public utilities costs it a half percentage point of annual gross domestic product. Colombia's GDP in 2018 was some $312 billion.